Southwestern bedspreads are fabulous additions to rustic decorating. Most peoplethinking of a southwest bedroom intuitively choose bedding with rich southwest colors in Indian designs as well as bedspreads and coordinated accent pillows and shams. Classic southwestern bed spreads are a perfect choice for setting the mood of your bedroom and set the stage for beautiful accents. 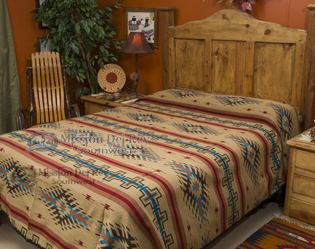 Rustic southwest, western ranch, lodge and Native themes are perfect with southwestern bedspreads. At Mission Del Rey, you’ll find an amazing array of Southwestern bedspreads and western comforters to choose from. Whether it is for your home in the city, a vacation cabin by the lakes, or your get away lodge in the country; you’ll be able to recreate the perfect rustic setting for your bedroom. Choose bedding with rich southwest colors in Native American designs as well as bedspreads and coordinated accent pillows and shams to create settings that match your décor, wall hangings and other furnishings. Our remarkable selection of bedspreads are a perfect choice for setting the mood of your bedroom, and can be used to set the stage for beautiful accents. Choose from the rich variety available, including rustic southwest, western ranch, lodge and Native themes. With their unique look, our collections of Southwestern bedspreads feature lively colors that can bring about the best in any of their surroundings. The vibrant shades and hues available feature a variety of geometric designs that bring to life the ancient Southwestern traditions. Along with well chosen shams and accent pillows, the right selection of bedspreads will create the ideal looking southwest style bedroom. Fabulous creations - Our deliberate selection of native American designs and patterns have been known to have a dramatic effect on people and spaces around them. With these bedspreads adorning the bedrooms of your lodges, homes and cottages, you’ll be able to recreate amazing memories of being instantaneously transported into the outposts of the wild west, the missions and forts of the frontier, and the grand canyons and hills of New Mexico and Arizona. Here at Mission Del Rey, we’ve gone to great lengths to ensure we provide our customers with the most memorable of Southwestern experiences. Our fabulous creations are made from the finest of fabrics that have been especially chosen to create that perfect look and feel of an era that used to be. And it’s not just looks that will captivate you! These creations are made to be extremely functional – no matter where they are used. Designed to impress, our creations are woven with quality fabrics and materials. They have been made to endure, and will keep you warm and cosy through all kinds of weather for many seasons to come. And there’s even more…! We’ve designed these fabulous pieces with ease of maintenance in mind. The deliberate choice of materials means our bedspreads, shams and accent pillows are easy to care for. Their rugged construction means you get to enjoy them for many years, without fear of wear and tear like many other Southwestern bedspreads you may come across. Unlike others you may have owned in the past, our spreads are an excellent choice. Dynamic usage - Inspired by the cave art of Native Americans, and built to the highest standards of modern weaving practices, Mission Del Rey bedspreads, shams and other products can immediately transform any space into a rustic, cosy comfortable nest. They come in a broad array of patterns, colors, hues and sizes, so you will always find one that fits perfectly with what your needs. Use these popular geometric designed or Native American nature-themed bedspreads to enhance the appearance of your own homes and lodges; or choose to give them away as keep-sake gifts to friends, family and loved ones. Whether it is a King sized, a Queen sized spread or a Twin sized bed that you want to cover – we’ve got just the right spread for you. The soft woven patterns on some of the classic bedspreads available here can blend in well with any southwest style décor. You’ll find many of our creations have intricate patterns that are woven, not printed, to match existing styles in your bedroom and surroundings. And to add variety to your home, lodge or cottage, while at the same time offering you choice, you’ll be able to dynamically use our reversible bedspreads to fit any mood or any occasion. Use them in the master bedroom, a guest bedroom or to adorn the room of a teenager. Our Southwestern bedspreads are so versatile they’ll fit almost any use you may have in mind. The soft fabric used means that you can use them as a throw to wrap around and enjoy a chilly night outdoors. And the warmth offered by them means you can even use them as blankets.